Learn how to configure shared log storage. This simple and easy-to-follow manual can help you precisely startup and manage your NetVizor using a shared log file storage configuration. Make sure to set this up utilizing a central server that has sufficient drive space! Open the NetVizor client (if it is running use your hotkey combination, enter your password) and click on "Activity Logging Configuration" then "Configure Log Storage Location." 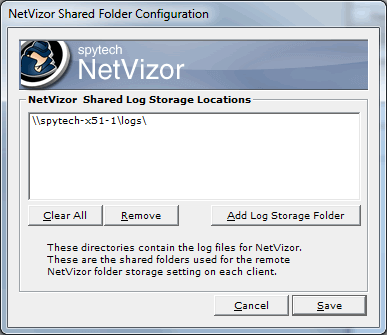 Click on the "Choose" button to navigate to the shared folder that you want logs stored on (shown below). If you know the path directly you can manually enter in this path. Click "OK" to choose the location. The log location will be changed to the path you just chose, as shown below. Click "OK" again to save the settings. Restart NetVizor's logging - logs will now be saved in this new location. 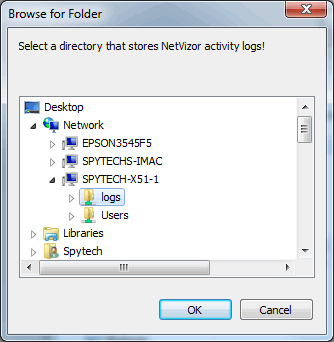 Now, open the NetVizor viewer software on your central computer you view logs from. 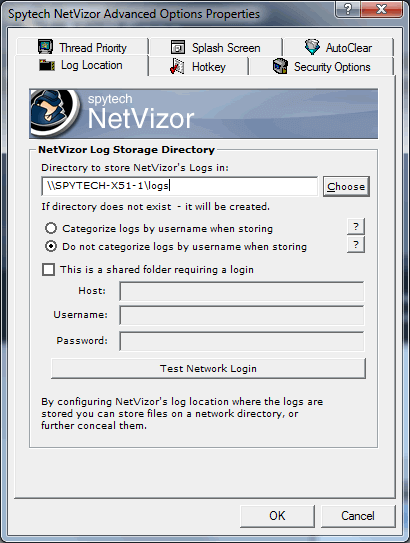 Click on the "Configure Log Storage Locations" menu in the "Options" menu to bring up the below window. Click "Add Log Storage Folder" to bring up the below screen. Navigate to the same path you chose in Step 2. 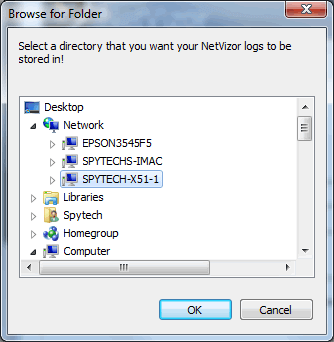 If this folder is stored on the computer the viewer is stored on, you can choose the local file path as well (instead of navigating to the shared folder in the Windows Network). Click "OK" to choose. The path you just chose will be added to the Shared Folders list, as shown below. Click "Save" to save this list. Done! If everything was done correctly click "Refresh All." Any logs created in this shared folder will be listed. Select a user/computer then click "View Activities" to view any activity logs.